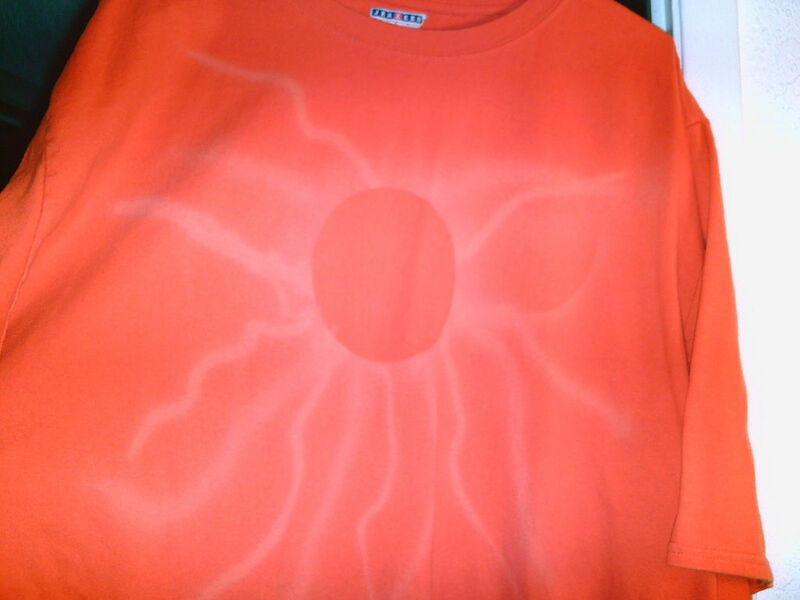 Using a bleach pen you can create a rad shirt in about 15 minutes! Insert your magazine/cardboard/plastic bag inside of the shirt. Smooth the shirt down if you want a flat drawing surface. Wrinkle it up if you want to try some funky effects! Shake and squirt a little bit of bleach onto a scrap piece of paper to test for consistency. This will help you get the hang of drawing with the pen before trying it out on your fabric. Check to see how thick your lines are. Draw! I just freestyled a griffin head, but you can use chalk to lay down a pattern first for more control. Anything you draw on the shirt will leech a little bit and your lines will be about twice as thick as what you draw. Watch your fabric. It begins to whiten almost right away. I let this one sit for about ten minutes before moving on to the next step. If you plan on drawing a big pattern plan to do it in batches. Draw, move onto the next step, and come back to draw some more later. Otherwise parts of your lines will not have the same lightness. You can always come back and do more, but you can't undo anything once it is done. Carefully remove the paper/cardboard/plastic lining from inside the shirt and quickly place your garment under running water. The bleach will be kind of thick so you need to scrub a bit to get it all off quickly. Gloves are a good idea here. Wring out the shirt and rinse again to make sure all the bleach is gone. Flop your shirt over a bar or put it in the dryer. Then you are ready to wear it! Since I didn't leave my bleach on for a super long time my lines are a light brown. If I want to make them lighter I can retrace the linework and bleach again. I can also keep adding onto the image again whenever I want or have friends draw on it. Adding embroidery, buttons, and appliques could be really fun accents to add after the shirt is done drying. Using this technique, which I think looks like reversed batik, you could make some really awesome fabrics to sew with, or curtains, etc. Please consider using a product called Anti-Chlor to neutralize the bleach after rinsing as water does not stop the action of bleach by itself. This product can be obtained from www.prochemical.com. I have no affiliation with this company other than sending them lots of money over the years to support my dyeing habit! I'm a very satisfied customer. Actually vinegar also contains the neutralizing power plus its a whole lot cheaper. Sick, do you have any preferences for the bleach pen, like a brand, and where can you get it? Tide makes one as well. Don't know which works better though. I've just been using a Clorox pen I picked up in the laundry section at QFC. AWESOME, You inspired me to make my own!!! Since im too cheap to buy a bleach pen, im using a high lighter and dipping it in watered down bleach! I wanted to use your design, but 1, i wanted mine to be unique, and 2 im not that good of an artist, im using a phoenix! Im gonna make an instructable like yours using my way, if its ok, ya know, no copyright or something, lol. Here is my Bleach experiment I used an airbrush. (SAFTY NOTE: I also used a respirator and goggles. I kept the design simple as being my first try. Sounds like it is worth experimenting with! Try it on some scrap fabric first. I have a feeling the lines you draw will be fairly thick because the fabric may soak up the liquid bleach too much, but try it out and let me know what your results were like. I love to know about new techniques! Hi again...This is my second attempt with this method ..! I made a small "booboo" on the shoulder ( The bleach bled..) ..but that gave me an idea to make flames for next time..!! Have fun..and as you can see you don't need to be an awesome artist to transform a t-shirt..Give it a try !!! What is a bleach pen? Can i fill a used up high lighter with bleech or something? Or heck...got a empty mustard bottle? That might work too! Oh thanks, are bleech pens from stationary stores or hardware? I bought mine at a grocery store.